The Centers for Medicare and Medicaid Services (CMS) has finalized a policy to provide separate Medicare reimbursement for EXPAREL® (bupivacaine liposome injectable suspension) when administered in ambulatory surgical centers (ASCs) through the establishment of the product-specific billing code of C9290. This code, which will provide payment for EXPAREL at average sales price (ASP) plus six percent, sets national Medicare reimbursement rates. In addition, the American Dental Association (ADA) has established a separate D-code (D9613) to reimburse for EXPAREL infiltration in oral surgery procedures. Both codes became effective on January 1, 2019. EXPAREL is a long-lasting local anesthetic formulation that can be used for abdominal, shoulder and knee surgeries, and oral surgeries. Perhaps most importantly, this local anesthetic helps to combat the opioid crisis by reducing the need for an opioid in an Enhanced Recovery protocol for quick return to drinking, eating and mobilizing (DREAM). All of these factors help the patient to be an active contributor to their care and recovery. Learn more. Have You Been Reported to the National Practitioner Data Bank? Did you know you can be reported to the National Practitioner Data Bank (NPDB) without your knowledge? Read John Fetcho’s latest Business of Anesthesia article for more information about the NPDB, including how to run a self-query. Learn more. The data submission period for the 2018 Merit-based Incentive Payment System (MIPS) Performance Year opened on January 2, 2019 and closes on April 2, 2019. Providers can submit their data by logging in to the Quality Payment Program Website. Data submission opens for providers who use the CMS web interface on January 22, 2019. Additional information is available through the 2018 Data Submission FAQs, published by the Centers for Medicare & Medicaid Services (CMS). The AANA has provided fact sheets which give an overview of the 2019 updates to the MIPS performance measure categories. The updates were published in the Physician Fee Schedule Final Rule, and include revised performance measure category reporting requirements, and the scoring weights attributed to each category. The fact sheets are available through the AANA’s Quality Reimbursement website. The Centers for Medicare & Medicaid Services (CMS) published the 2019 list of Qualified Clinical Data Registries (QCDRs) and Qualified Registries that providers can use to report quality measure data for the Quality Payment Program (QPP). Members can access the lists on the AANA's Quality Reimbursement website. For members who may need to select a QCDR for 2019, SCG Health is enrolling for Merit-based Incentive Payment System (MIPS) reporting from January 2 through February 14, 2019. AANA members benefit by taking advantage of a special code to earn six free Class A CE credits on AANA Learn®, and also can increase their business acumen through the Anesthesia Business Seminar online course that begins in April. Are you taking advantage of your exclusive member code to get up to six free online courses through AANA Learn? That’s a value of up to $210. Just enter MEMBER19 at checkout. Plus, you’ll find other Member Exclusives made possible with the support of our industry partners. Learn more. When you complete this eight-week online course, led by Larry Hornsby, BSN, CRNA, and Juan Quintana, DNP, MHS, CRNA, you’ll come away with a personalized plan and the confidence to follow it. You’ll develop your change-management skills, learn to effectively communicate your value, and know how to increase cost-efficiency. From developing proposals to building your negotiation skills, you’ll get a personalized experience that you can’t get anywhere else. Learn more. Passavant Area Hospital in Jacksonville, Ill., "is changing many of its pre- and post-surgical processes to limit stress on the body and to speed recovery for its patients," according to local newspaper, the Jacksonville Journal Courier. Josh Newman, MSN, CRNA, the anesthesia department manager, is featured in the article, and Mark Ruff, BSA, CRNA, APN, appears in an accompanying photograph. Read more. Download free social media graphics to use on your Facebook, Twitter, and Instagram pages. Be sure to add the following hashtags to your posts: #CRNAWEEK and #WEARETHERE. Don’t forget to tag your state legislators and hospital administration (Example - not a real account: @senatorjohndoe) and, of course, @aanawebupdates. With CRNA Week just around the corner (January 20-26, 2019), let’s spread the word that “Every Breath, Every Beat, Every Second – WE ARE THERE!” This is a great opportunity to educate the general population about the important work that CRNAs do every day, for every patient. Mark Silberman, JD, partner at Benesch, Friedlander, Coplan & Aronoff LLP, has been named the chair of the firm's White Collar, Government Investigations & Regulatory Compliance Practice Group. He is also a member of the firm's Health Care & Life Sciences Practice Group. Silberman has broad experience with various white collar investigations and actions. His practice focuses on both assisting clients to avoid compliance and regulatory issues as well as litigating those issues when necessary. Silberman is adept at navigating government, a skill set upon which his clients rely. Before entering private practice, Silberman served as chief of drug prosecution for the Sangamon County, Ill., State's Attorney's Office and as a special assistant U.S. attorney in the Central District of Illinois. His previous government service includes acting as general counsel to the Illinois Certificate of Need Board and the deputy chief counsel for litigation and enforcement of the Illinois Department of Public Health. Silberman also serves as the outside general counsel to the American Association of Nurse Anesthetists. Learn more. Join us at the Grand Hyatt Washington April 6-10, 2019 in Washington, D.C., to hear from government officials William Hoagland, senior vice president of the Bipartisan Policy Center, and Bradford Fitch, president and CEO of Congressional Management Foundation. With a new Congress in session, this is an excellent opportunity to educate a fresh crop of legislators about the critical work CRNAs do every day. With beginner and advanced concurrent sessions on Saturday, you can choose your advocacy comfort zone. Learn more. "You can't truly understand the importance of advocacy unless you are physically there, seeing it in action. 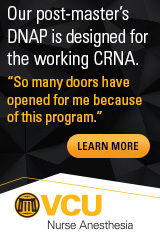 CRNAs need to be there!" This course offers technology-based learning through gamification in the form of virtual simulation. This simulation course contains three individual, interactive case scenarios in which the user will learn to use the 2016 CDC Guidelines to reduce overall opioid prescriptions and look toward multimodal methods of pain control. Learn more. Held February 13-16, 2019, in Houston, Texas, the Assembly of Didactic and Clinical Educators (ADCE) is the only forum for nurse anesthesia educational programs to discuss current educational requirements and how they will define the future of the profession. Formerly known as the Assembly of School Faculty, the new meeting name clarifies that all didactic and clinical educators are welcome! Please join us for a Welcome Reception on February 13. Educational sessions begin February 14. Learn more. Designed to enhance your knowledge of the clinical sciences related to upper and lower block anesthesia, the Ultrasound-Guided Peripheral Nerve Block workshop features didactic and hands-on training. Held March 16-17, 2019, at the AANA national headquarters in Park Ridge, Ill., you will expand your skills and expertise in upper and lower extremity nerve block anesthesia. Attendees will receive Upper Extremity Blocks, written by featured speaker Charles A. Reese, PhD, CRNA. This day-and-a-half workshop, held March 23-24, 2019, in San Diego, Calif., will inspire state leaders to lead and influence through crucial conversations and emotional intelligence. Other topics include state board orientation, governance principles, and sharing best practices and success stories with other state association leaders. 2019 AANA Annual Congress: Engage. Unite. Evolve. See more information about future meetings, workshops and assemblies. Ready to make those changes on your New Year’s resolution list or finally buy your dream home? Now’s your chance to take advantage of $500 cash back, plus a $1,000 closing-cost credit¹ when you purchase or refinance a home. With different custom mortgage options available, our dedicated team of Home Loan experts is here to help find the best way to help you achieve your unique goals. Unsure of what happens during the mortgage process? Register here to check out our upcoming webinars! We’re offering you free, educational webinars about homebuying, refinancing, credit and general mortgage information. Get started now! Visit VIP.QuickenLoans.com/AANA or call (855) 245-5911. College graduates with Federal student loans have a number of repayment options at their disposal. This guide will walk you through your options so you can make an informed decision when choosing a repayment method. Download guide. St. Vincent has an opportunity for a full-time Certified Registered Nurse Anesthetist at St. Vincent Anderson Regional Hospital! Learn more. CRNAs employed by AG Associates perform anesthesia in multiple settings including the in-patient hospital setting (Level 1 trauma) as well as in surgery centers. Learn more. Anticoagulant therapy is being used more frequently in expecting mothers; however, the drugs are contraindicated for spinal anesthesia—the most common pain relief strategy for cesarean section. Researchers in China sought to learn more about minimally invasive spinal anesthesia in this setting. Their randomized controlled study involved about 200 parturients taking anticoagulant medications and scheduled for c-section. Minimally invasive spinal anesthesia, which uses a 27-gauge pen-type fine needle for puncture in order to reduce ligament damage, was delivered to 110 of the women. Traditional spinal anesthesia using 22-gauge traditional spinal needles was administered to 92 others. Low back pain and postdural puncture headache after delivery—the primary efficacy endpoints—were not observed in either group. Visual analogue scale during subarachnoid puncture (VASdural) and VASdural of back puncture point at 24 hours postoperatively, however, were lower in the intervention group. In addition, maternal satisfaction was higher in the experimental group compared with women who received conventional spinal anesthesia. The evidence supports minimally invasive spinal anesthesia as a safe, reliable, and viable option for c-section patients during maternal anticoagulation therapy. From "Minimally Invasive Spinal Anesthesia for Cesarean Section in Maternal Anticoagulation Therapy"
BMC Anesthesiology (01/12/19) Vol. 19, No. 11 Huang, Dan; Zhu, Linjie; Chen, Jie; et al. New evidence suggests that combination therapy with ketamine and naltrexone can simultaneously treat the symptoms of substance abuse and depression, which often go hand in hand. JAMA Psychiatry recently ran a paper reporting on a preliminary study funded primarily by the U.S. Department of Veterans Affairs. The project was carried out by researchers at Yale University, who worked with five patients suffering from comorbid drug addiction and depression. Participants were treated with a long-lasting preparation of naltrexone and then administered ketamine. Four of the five responded to the first dose of ketamine, and all five experienced relief from depression with multiple doses. The findings challenge earlier research indicating that ketamine's antidepressant properties were muted by naltrexone, which is used to fend off opioid and alcohol cravings. They also challenge the notion that ketamine might combat depression by stimulating opiate receptors. The researchers note that bigger studies are warranted. From "Naltrexone, Ketamine Combo Shows Promise for Depression and Addiction"
Researchers used anesthesia to help test new smartphone technology designed to save opioid abusers who overdose while alone or with someone who cannot assist them. The Second Chance app uses a device's speaker and microphone to monitor the user's breathing for slowed or no activity—either of which could signal an impending overdose. If an emergency is detected, the app could call 911 or send a text to friends or family who have access to the overdose antidote naloxone. The team from the University of Washington in Seattle tested the innovation at a facility in Vancouver where self-injections of fentanyl and other illegal opioids are allowed under medical supervision in an effort to prevent overdose. There, the app picked up dangerous breathing patterns in 94 opioid addicts that could have represented the onset of a lethal drug overdose, successfully catching 47 out of 49 cases where the user stopped breathing. The app was also tested under simulated overdose conditions using anesthesia. Out of 20 volunteers who received standard anesthetics to slow or stop breathing for 30 seconds, Second Chance detected abnormal respiration in 19. The app is described in a report in Science Translational Medicine. From "A New App Tracks Breathing to Detect an Opioid Overdose"
Researchers assessed the use of peripheral nerve block (PNB) when administered as the only anesthetic technique during above knee amputation (AKA). The single-site, retrospective study included 57 high-risk patients who underwent the procedure between 2010 and 2016. According to the analysis, surgery with PNB was completed successfully in 91 percent of the patients. Reporting on secondary outcomes, the investigators calculated the 30-day mortality rate at 12.3 percent and the one-year mortality rate at 47.4 percent. They also noted that 95% of the sample required intraoperative sedation and analgesia; most had stable hemodynamics during surgery; and two-thirds received combined femoral, obturator, and sciatic (FOS) nerve blocks. About a third of the patients underwent combined femoral and sciatic nerve blocks, and they needed higher sedation analgesia. Based on the results, PNB appears to be a viable option for reliable anesthesia for AKA in high-risk patients. Choosing FOS nerve block over femoral-sciatic block, meanwhile, curtails the dose required for sedation–analgesia during the operation. From "Peripheral Nerve Blocks for Above Knee Amputation in High-Risk Patients"
Journal of Anaesthesiology Clinical Pharmacology (Winter 2019) Vol. 34, No. 4, P. 458 Chandran, Rajkumar; Beh, Zhi Yuen; Tsai, Fung Chen; et al. Odds ratios generated by a new meta-analysis back up the common presumption that obstructive sleep apnea (OSA) independently predicts risk of difficult and/or unsuccessful intubation. U.S. and Canadian researchers performed a literature search, which yielded 16 articles of interest. Meta-analysis of those studies correlated OSA with a 3.44-fold greater odds of difficult intubation and a 3.39-fold greater risk for difficult mask ventilation. The likelihood of combined difficult intubation and difficult mask ventilation, meanwhile, was 4.12-fold greater in OSA patients than in patients without the condition. Laryngeal mask airway failure occurred at about the same rate in both OSA and non-OSA patients. Researcher Mahesh Nagappa, MD, an assistant professor of anesthesia and perioperative medicine at Western University in Ontario, says the findings underscore the importance of flagging OSA patients before surgery. The evidence was presented at the 2018 annual meeting of the International Anesthesia Research Society. From "Sleep Apnea Again Linked to Worse Airway Outcomes"
Researchers conducted a randomized study to compare remifentanil with dexmedetomidine for endobronchial ultrasound-guided transbronchial needle aspiration (EBUS-TBNA) under monitored anesthesia care (MAC). The primary endpoint was number of episodes of bradypnea, apnea, or hypoxia. Among 60 nonintubated study participants, dexmedetomidine was associated with fewer of these serious respiratory adverse events than was reminfentanil. Secondary outcomes—including patient satisfaction, pain, coughing, vocal cord mobility, nausea and vomiting, sedation depth, and endotracheal lidocaine use—were comparable between the two sets of patients. The exception was discharge time from the postanesthesia care unit (PACU), which was longer for participants assigned to dexmedetomidine. The results indicate that dexmedetomidine, versus remifentanil, triggers fewer respiratory complications during EBUS-TBNA under MAC, with no difference in overall operative conditions. Time to PACU discharge, however, is prolonged for dexmedetomidine recipients. From "Dexmedetomidine Versus Remifentanil for Monitored Anesthesia Care During Endobronchial Ultrasound-Guided Transbronchial Needle Aspiration"
Anesthesia & Analgesia (01/19) Vol. 128, No. 1, P. 98 St. Pierre, Patrick; Issam, Tanoubi; Verdonck, Olivier; et al.